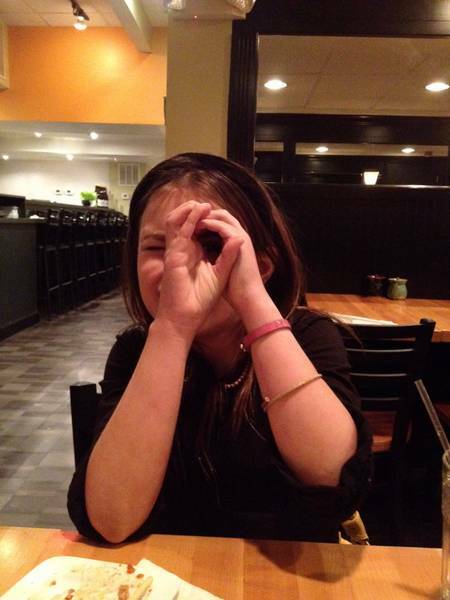 Katie is sitting across from me at the table, having coerced me to stay out for dinner after her visit to my office. It didn’t take much (coercion that is), but the coercion is part of the game. We both pretend that staying out for (fill in the appropriately timed meal) is not a foregone conclusion. We propose it to Daddy and ask if he’d mind if we stay out ‘just a little while longer.’ He pretends that he didn’t already plan around us being gone. It’s what we do. She is telling me about school. About the other kids. About the mercurial nature of fifth-grade girls and how much it drives her crazy. She pushes the food around on her plate as she speaks. “It’s just that .. well .. ” She pauses. I assure her that whatever it is, there will be no judgement. I tell her the Buddhist parable of the mustard seed – the one that my dear friend Judith shared with me so long ago now. The story of the woman who has lost her son – who believes that she is completely alone in her grief. The story in which the Buddha commands her to collect a bowl of mustard seeds – each seed, he tells her must come from a house that does not know loss. And so she goes from house to house in her village, asking for seeds. And the villagers feel for her and offer them readily. But when she asks if perhaps a son or a daughter, a father or a mother had died in their family, each and every one answers, Yes, we have lost a beloved. And she discovers that there is no house – not a single one – that does not know loss. I tell her that the word PERFECT came at me like a weapon. That I couldn’t imagine that he was serious. MY family? The one that was about to be split down the middle because staying together in a house that resembled a war zone was no longer feasible? That one? But through his lens, I explain, he saw – or thought he saw – or wanted to see – the PERFECT family. Katie takes it all in – every drop. She lets out a world-weary sigh. I sit back in my chair and try to take it all in. I am in awe of my kid. She giggles. Her attention is drawn to a table nearby, where two young women are apparently enjoying their sake a little more than their food. One of them has been LOUDLY regaling the other with the story of a date she’d recently had with a guy she’d met online. Katie has not hidden her annoyance. She rolls her eyes again, then motions for me to lean in closer, so I do. “I have an idea,” she whispers. I tell her I’m all ears. I laugh, then sit back. She motions me in again. She sticks out her bottom lip in a perfect pout. We both crack up. Katie leans in one last time. Nope, I could not have designed her better. Katie is an amazing child! I could not have designed either of you better! This. So perfect. In all its imperfections. Sigh. What a lovely girl you have. So…. did you?!?! Because you KNOW at that point you REALLY wanted to! LOL…you KNOW you wanted to! I love your daughter for exactly who she is. One day, I hope she sees how phenomenal, how incredibly perfect she is just as herself. I’ve known a lot of young women in my lifetime and I can honestly say I don’t think I’ve ever known one as self-aware, big-hearted and truly invested in being a genuinely good person as your Katie. I LOVE HER. AND YOU. (sorry. Shouting is contagious). Katie is the coolest kid ever! Those who get to know her when she is being her real self are the luckiest and her mom and dad are even luckier because they get to live with her and love her for a lifetime. Katie is just wonderful, and so profoundly self-aware. Both girls are an absolute gift! My God, I love this. And her. And you. This was a great blog post. I REALLY enjoyed it. How old is she? Nevermind, I see the 5th grade tag above the posting. My oldest NT daughter is in 4th. They’re right there on the cutting edge of that whole popularity show. I see it happening already with some things. . . it’s very sad. Her friendships so far have been so open and true and now they’ll start to become more showy and paranoid. This post is layered for me, since so much of my Autistic daughter Lily’s therapy time is spent attempting to make her “indistinguishable”. I think many many people forget how neurotypical kids spend their lives trying to make themselves indistinguishable from their peers. And how it all dovetails with the idea of neurodiversity and acceptance not just of children and adults with autism. . . but of ALL. PEOPLE. For Katie, an Earnie Lawson quote in CHADD’s Attention (ADHD) magazine: “Never compare your insides with other people’s outsides. It just isn’t a fair comparison; you know everything about yourself and nothing about them.”. Oh, Mom. God bless Katie. God BLESS that Katie. Oh, wait…I think He already has…with a mom like you. she is just scary smart…and with that big heart of hers, she is truly a unique, singular person…a rare one. thanks for sharing this conversation, moving stuff. This brought back so many of my own feelings of inadequacy back when and throughout the years. Katie seems more put together than any child I have ever heard about. That post was perfection!!!! Loved every precious word!! Thank you!!!! That could be a greeting card! Maybe she should start her own line of Teen/PreTeen Greeting Cards. Reminded me of the “Get Service” video: http://youtu.be/LfeXxkbgCVE A young man is given a pair of glasses that let him see the struggles of everyone around him. That is the stuff of memories, and they will get her through the tough times in life. Good for you Mama, you are the best and you are making the best of her and your life too…..
How fortunate she is to have a mama to really talk to. I admire and love you so very much. When my daughter Kate was first diagnosed with autism, I felt the weight of the world on my shoulders. I longed for a cavalry that was never going to come. How could they? The cavalry was unaware of autism. So we need to be our own advocates, our own cavalry. You are doing a great job. Not just with Brooke, with the WHOLE THING. The all of it. You know what I mean? Anyway, in order to get the Unisphere lit blue. We need the cavalry of our web based community. The bloggers. The press release will happen on Monday. But, big deal. The families committed to helping their loved ones handle the challenges are the only ones that matter. I’m not looking to raise money to present a big check to a big agency. I am looking for support to generate more autism awareness and funding will be used to create programs in the park every year during autism awareness month that will be for people with autism. I hope that you decide that you would like to support this project. Whether you do or not…everyone knows you are ALL IN anyway. And, I know how busy you are. Thanks for all you do. Shhhhhh listen. I think I hear the cavalry coming. Tell Katie this: At 23, I am myself. I do what I want, what I love, what I like, and I am happy. Was I always this way? Nope. At one point I really cared about what other people thought. Now? I’m just me. And I love life. and I am so happy. But at her age, I wasn’t like that, nor could I vocalize it like you can! You’re gonna be FINE baby girl. You are wise beyond your years! love this. LOVE it. thank you.